O&O AutoBackup Does One Thing Well...But Is One Thing Enough? O&O AutoBackup (free in January 2012; $30 with a 30-day free trial starting in February 2012) is a generally easy-to-use backup program with one feature especially handy for frequent users of external drives. It will back up any data you choose, automatically, without user intervention, when you insert a removable drive you've defined as the repository for your backup. That's a neat trick, but the program is otherwise limited in ability, suffers a number of design oversights, and occasionally employs unexplained and possibly confusing language. AutoBackup needs scheduling and/or continuous backup. Many users I know attach their backup drives in the morning and store them at night. If that's your practice, you must manually run a backup (possibly a time-consuming task) before you remove the drive at night to make sure the latest data is on there. Also, the program would be more useful overall if it allowed a secondary backup location and backing up to an internal drive. O&O AutoBackup is simple to use, but why not just put "Close" and "Minimize" in the buttons? AutoBackup did not understand the abstraction of Windows libraries such as Documents, which points to both My Documents and Public Documents. You need to explicitly select a directory such as My Documents. Also, the drop-down menu from which you select a destination drive doesn't expand after the refresh button is clicked. I had to click on tiny arrows to scroll to the newly added drives. Showing all drives in the list is such common behavior that initially I thought AutoBackup had not found the new drives. In addition to regular and incremental backups, AutoBackup can perform a synchronization which updates the backup with the current state of the source locations. However, the program doesn't explicitly state its methodology as I just did. Synchronization can mean one-way in either direction between two linked locations, or a two-way process reflecting the changes in both locations based on the date of occurrence. Call me paranoid, but when I see the word synchronization, I want a concise explanation of what a program is actually going to do. O&O produces some great software programs (such as O&O DiskImage) and AutoBackup has the potential to join that company. For anyone who wants to simply insert a drive, back up and remove it, it works well…but it's a one-trick pony that won't cover everyone's needs. O&O AutoBackup is free during January 2012, but $30 after a 30-day free trial beginning in February. Note: The link takes you to the vendor's page, where you can download the software. 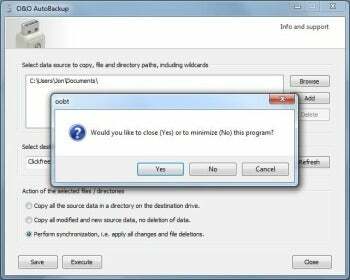 AutoBackup's backup on insertion is a neat trick, but the program is otherwise limited.